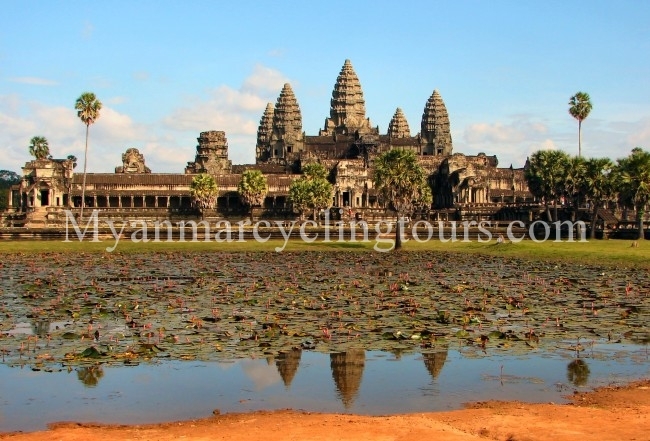 Depart from the hotel on the main road and cycling through Angkor pass check point. Cycling through the shady road with a little pumping because of the a few pot-holes. There you will begin to see Kravan temple, Banteay Kdei, and stop at the famous Ta Phrom, embraced by the roots of enormous fig trees and gigantic creepers. Visit Ta Phrom (45 minutes-1 hour). It was built in 12th century by the famous King Jayavarvan VII indicated to his mother. While clearing back the forest archaeologists decided to leave the vegetation of Ta Phrom in place to serve as a reminder of how the original discoverers found it and the other Angkor temples. Many of the trees have grown around and through the remains and soar high above the temples. Depart from the hotel, crossing the bridge at Old Market to cycle 15km toward Rolous Group. The first 2km, is on the tarmac road toward the bus station. Then, passing the rice field and the village. Rolous Group was the first capital of Angkor Empire during 800 A.D.
Visit the Pre-Angkorian temples including Preak Ko, Bakong and Lo Lei. Afternoon, cycling to Tonle Sap Lake. Turn left at the crocodiles farm crossing the bridge. Then cycle on small road along the river through villages, pagodas and schools. Depart from the hotel on the main road. Arrive at Angkor Wat and turn left to the west. Continue to cycle 2km before turn right to the rural road. The road is good for cycling as you can avoid the busy traffic but you can see rice field, village, pagoda.